I stumble across a nice amount of grilled cheese recipes on the Internet but normally read them and then close the browser tab never looking back. This was not the case with NYtimes.com’s Greens and Mushroom Panini. 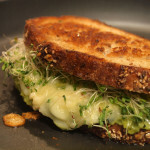 The recipe calls for greens, such as kale, chard, turnip greens or mustard greens, none of which I have eaten let alone included within a grilled cheese sandwich. I was intrigued. Recently, I had a Twitter conversation with WhatWeChowBlog regarding the 2010 World Championship Cheese Contest in Madison, Wisconsin. She suggested that I cook a grilled cheese with the winner of said contest. I agreed, thinking that was a great idea. What I did not know was that I was already planning to cook a grilled cheese with the winner. 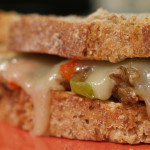 While just looking through my grilled cheese Google alerts, I received notification that Swiss Gruyere took top honors at the 2010 World Championship Cheese Contest. My grilled cheese was cooked last Wednesday. Funny coincidence, eh? At Whole Foods, there were two different varieties of Gruyere: Aged and Cave Aged, with the price being a minimal difference. Which one was the best choice? I did not know and unfortunately, the cheesemonger was not as friendly as hoped and missing most of the time. As the sous chef and I went back and forth trying to decide, we came across a lady who had actually been to Gruyere in Switzerland and tasted the local cheese. She suggested we go with the cave aged because cave aged is more unique and would probably add some interesting flavor as opposed to simply “aged,” which could mean just about anything. Also, she looked at the rind and coloring and believed the cave aged to be a brighter, better color. I listened and went with the cave aged. It turned out well. When writing this entry, I believed that I had not yet used Gruyere in a grilled cheese and had even barely tasted the cheese. However, it appears that was not the case. I have created so many sandwiches, that I forgot about my Grilled Spinach & Goat Cheese Croissant, courtesy of AOL, created back in March, 2009. It appears that Gruyere did not make that much of an impression on me. However, now, after tasting this Gruyere, I will never forget the cheese. I do not know if it was because this variety was cave aged or if this is how all Gruyere tastes (remember: I don’t remember the last type I tasted), but this cheese was fantastic. A lot of the time when I taste cheese and then want to write about them I have some difficulty in describing exactly what they taste like. Adjectives like soft, buttery and smooth get very boring after being used over and over and over. With Gruyere, none of these adjectives come to mind, instead the one and only adjective needed to be used is nutty. Nutty and fantastic. I traveled to the local market, trying to find any of the listed greens. The kale and chard were right next to each other, giving me a great opportunity to compare them both. The chard looked simple and somewhat boring while the texture and broccoli-like appearance of the kale intrigued me. I could not find turnip or mustard greens. I went with the kale as my greens of choice. 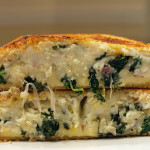 Even after eating this grilled cheese sandwich, I am not sure what kale tastes like. According to the Internet, kale adds a very healthy, earthy flavor to any dish. Wikipedia says that kale can provide an intense addition to salads, can be added to mashed potatoes or even a Portuguese soup. I did in fact try my leftover kale in mashed potatoes and it was very different. If you end up having any leftover, I would suggest trying mixing it in your favorite mashed potato recipe. 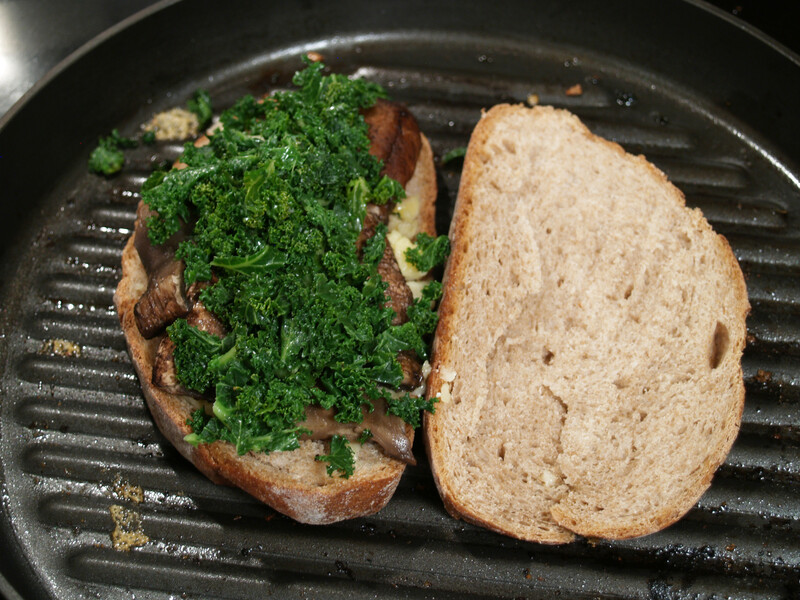 The first steps in the preparation of this Greens & Mushrooms Panini (aka grilled cheese) was to boil the kale and then place it in an ice bath. 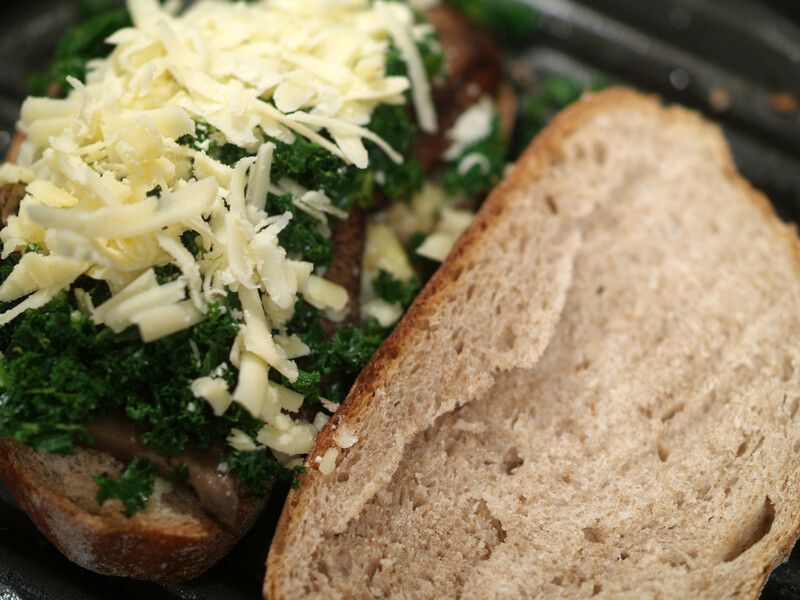 While the kale rested in the ice bath, it was time to grill the portobello mushroom. 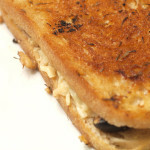 Since the recipe is for a panini and not a grilled cheese, the recipe suggests grilling the mushroom in a panini press. Since I do not have a panini press, yet, I simply grilled it on my favorite grill pan. All that is needed prior to grilling is to brush the mushroom with some olive oil. After only grilling the portobello mushrooms for a couple minutes on each side, it was time to then grill some chopped garlic and toss in the kale. That was all that was needed to prepare the ingredients. 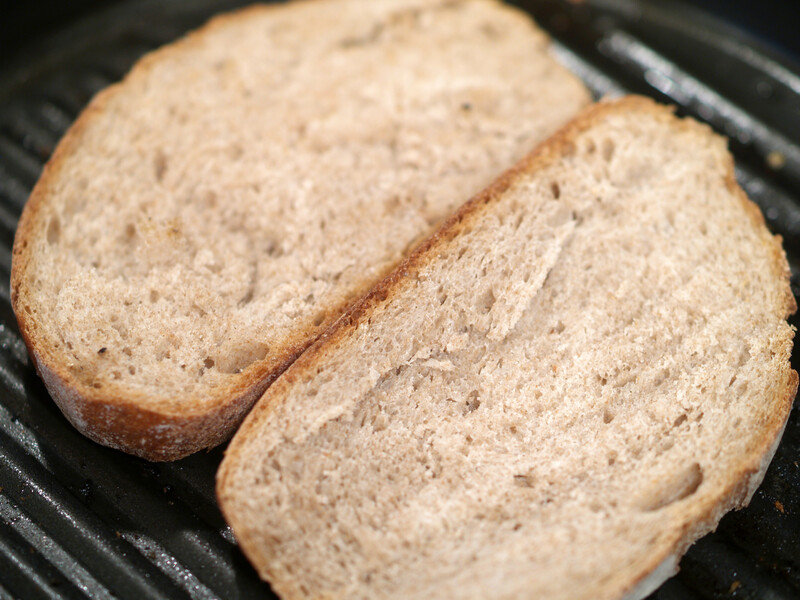 The recipe calls for whole wheat bread so the options were many when trying to choose a bread. I was at my local Giant Eagle where I found a nice whole wheat, similar to the one used by the NYT, but it was rather large and we still had a lot of bread at home so I passed. (Plus, Passover, the anti-bread holiday, was quickly approaching. No chametz allowed.) Instead, I traveled over to Stone Oven and purchased a smaller whole wheat pugliese that turned out to be a great choice. 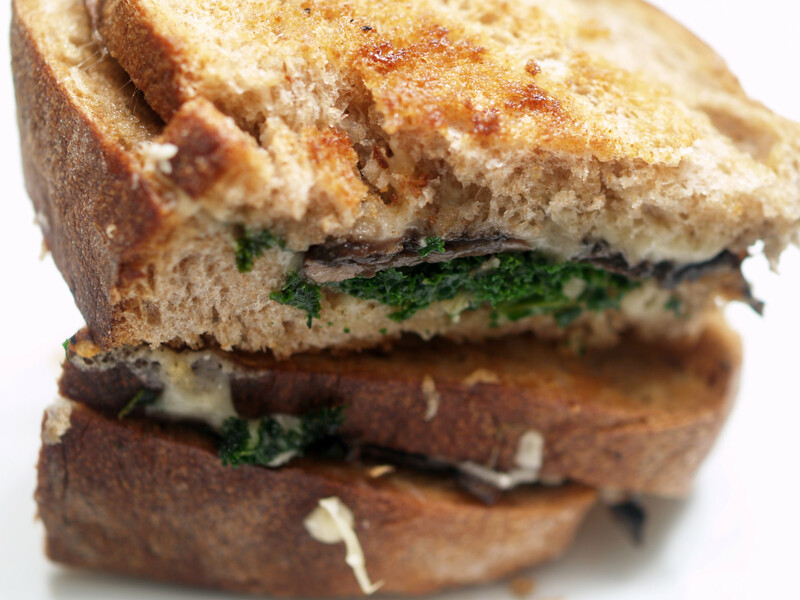 This bread provided a great crunch that only enhanced the deliciousness of this sandwich. There were two great techniques that I learned from creating this grilled cheese that I may continue to use in the future. 1. 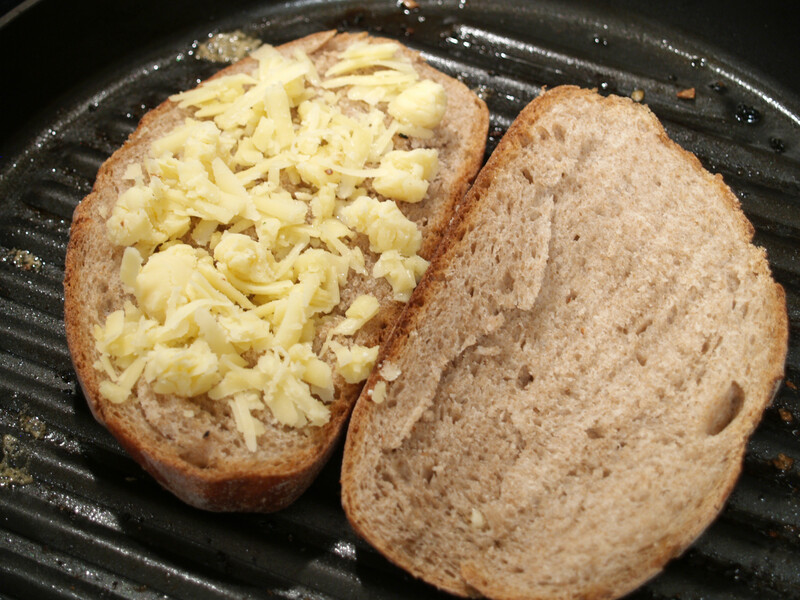 The recipe calls for the outside of the sandwich to be brushed with olive oil, since it would be placed within in a panini press. Since I was intrigued by the opportunity to use olive oil for a grilled cheese sandwich, I passed on using my usual butter and went ahead and used olive oil instead. I believe this made the bread much more crunchy and in turn, better. Sure, I left the burner on low as I assembled the sandwich and took pictures, but I don’t think that was the exact reason the bread got so crunchy. In my opinion, the olive oil was. I plan on trying this again to see if the end result is similar. 2. Normally, I place cheese only once on a grilled cheese. This sandwich called to place the shredded cheese on the bread, then the ingredients and then more cheese. I can only imagine the multiple placing of cheese enhanced the taste of the grilled cheese and was part of the reason the sandwich was so good. 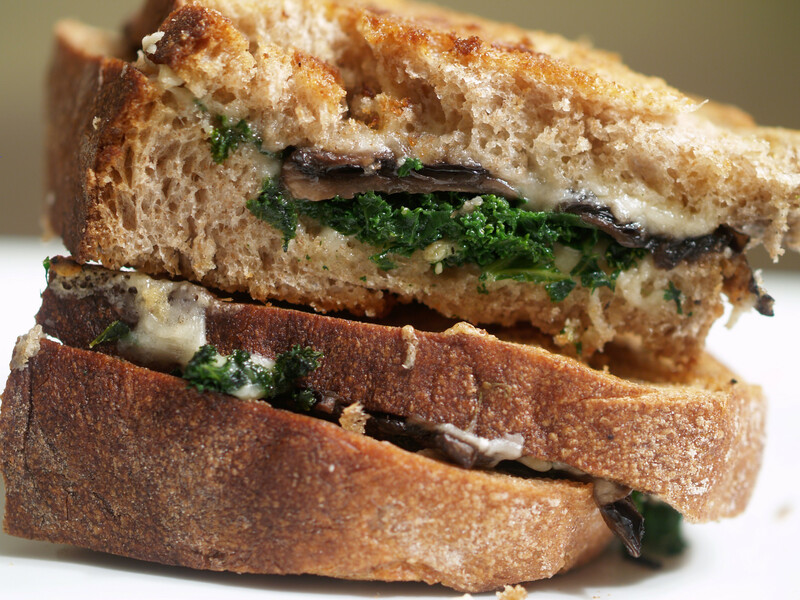 The nutty flavor of the Gruyere added with the portobello mushroom and kale (greens) made for an amazing grilled cheese. I am not 100% sure I could taste the kale but I do believe that if I left it out, the sandwich would be missing something. 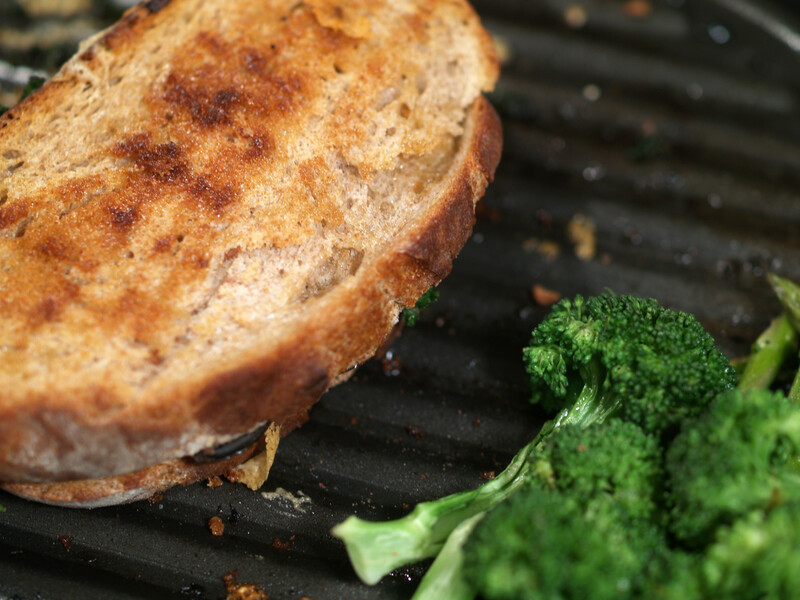 It would be interesting to try this grilled cheese with one of the other greens to see if the taste would vary even if only slightly. 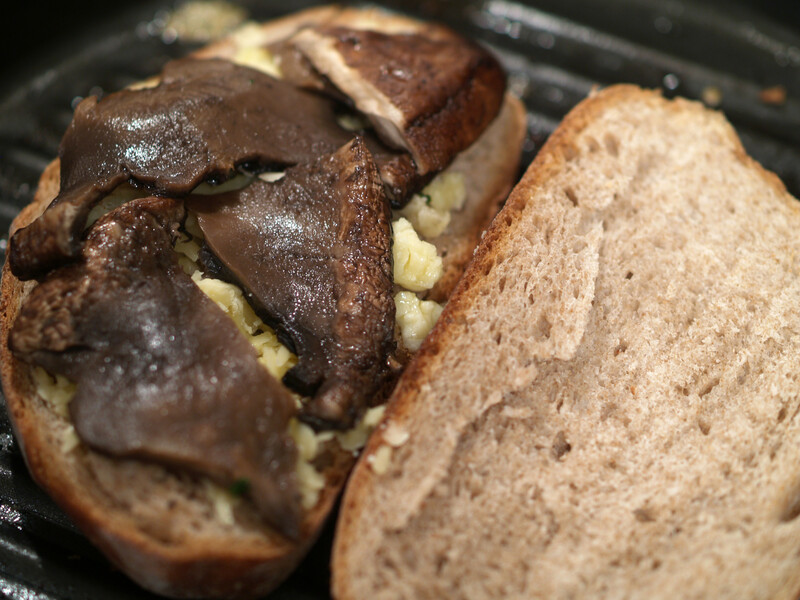 And of course, portobello mushrooms make an awesome addition to just about any sandwich or are great by themselves. All in all, I would say this grilled cheese was a real winner and the NY Times and Martha Rose Shulman put together a fantastic recipe. 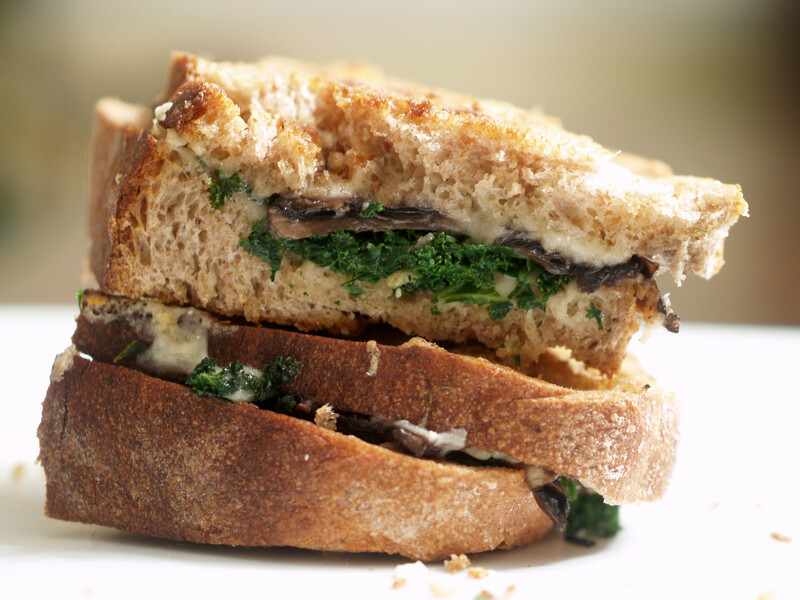 Now it is time for you to cook the Greens & Mushrooms Panini. 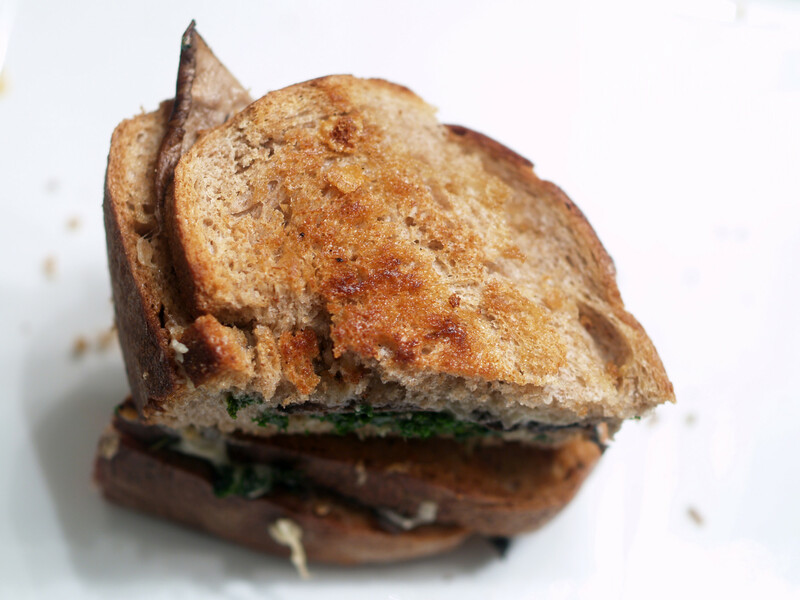 Posted in Grilled Cheese and tagged A, garlic, grilled, gruyere, kale, multigrain, portobello mushrooms, pugliese. Glad to hear this one is as good as it sounded in the article. I’d been thinking about giving it a try myself, the greens part was particularly interesting. This sandwich looks so fabulous! I already love chard and kale, but was just today was faced with turnip greens in my CSA box. That’s how I found your recipe. Kale is actually the tougher of the three, texture wise even when properly cooked. I also received rainbow chard in my box as well and I think that would be great in this sandwich. It’s more tender and sweeter when cooked than kale. If you like smoked cheese there is a Smoked Gruyere out of Connecticut that is TO……..DIE……….FOR! I can pass along the specifics if you like. And last kale; I have a super easy kale recipe that my entire family loves, in fact, my husband says that if he were on death row this would be his request for last meal. I can pass along that recipe too if you like. 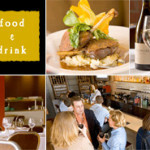 I’m glad I found your site and I look forward to poking around it!